Steven Shields has been studying various Mormon schismatic groups since he was in Seminary in the 1970s. We’ll get acquainted with him in this first episode, and learn more about his background, and why he got so interested in our Mormon cousins. What does he know about the temple lot? There are several sections in the Doctrine & Covenants where Joseph Smith received revelations on a temple in Missouri. That temple was never built. 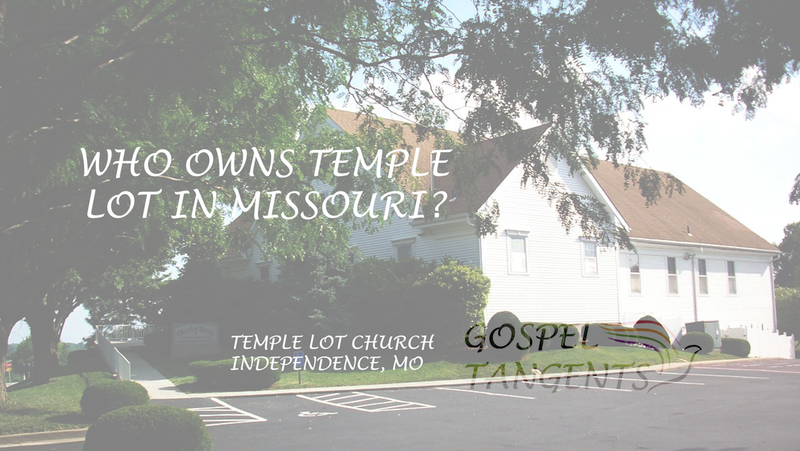 Who owns the original temple lot on Independence, Missouri? It turns out some of our Mormon cousins own it. Steve: The Hedrickites is a name that people use. I don’t like to use -ites or schism or break off or offshoot or splinter. I’ve tried to avoid all of that language in my new addition because I don’t think it’s helpful. All that stuff started out as pejorative, and in some ways it’s still used as a pejorative. And so I thought, let’s try and get away from that, you know? We don’t say Pope-ites or Luther-ites or those kinds of things. So maybe we can get out of that mode in the Latter Day saint movement, I don’t know. GT: There’s too many -ites in the Book of Mormon. Steve: That’s where it all probably comes from. I guess. I’ll let you keep Israelites. But yeah, to be honest, my paper on the earliest church was an anti-RLDS apologetic and my seminary teachers loved it. We’ll talk more about how Steve go interested in our Mormon cousins. Find out our next conversation…. This is the Temple Lot Church, owned by the Hedrickites. If you’re interested in other groups, here’s an interview with Jim Vun Cannon, Counselor in the Remnant Church of Jesus Christ of Latter-day Saints. We’re about ready to finish our conversation with John Hamer and Lachlan MacKay of the Community of Christ and do a Mormon Schisms Tour! In this next conversation, we’ll talk about how confusing it must have been to live following the death of Joseph Smith. There isn’t anything in particular that necessarily happens for the branch. So like I say for the Hedrickites, they are one of five, maybe, of these branches that are in a cluster around Bloomington, Illinois. I think probably at some point or another, they will have been affiliated with Strang, but at a certain point, maybe when he “affiliated,” whatever it even means. Strangite missionaries will come through there, and that’s one of the reasons why maybe they didn’t gather and go west. 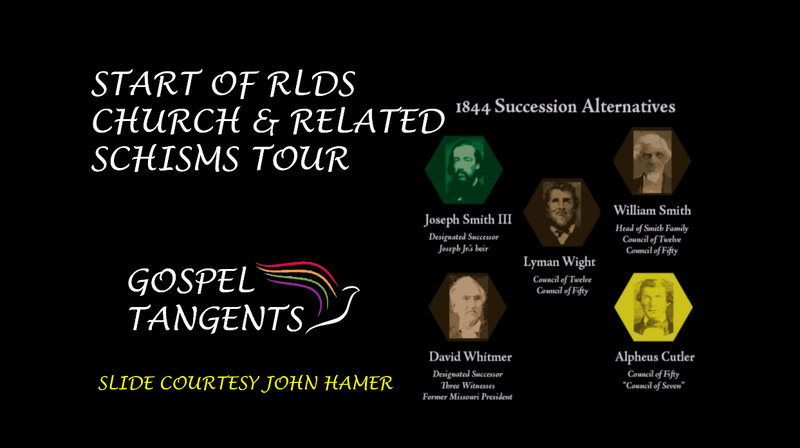 We’ll talk about the founding of the RLDS Church. John: This is the origin of the Reorganization. So the branches start to pray about it. They fall back on individual personal revelations for the individual congregations, the pastors. They start meeting together. As they are thinking about it, William Smith has a church in the meantime and William Smith has been promoting the idea of lineal succession. There has been, (I think I mentioned a while ago), there’s the sense that Joseph Smith’s posterity, somebody, one of his sons is going to be the successor or will emerge as the successor. They start to regather these branches and the form a conference organization, which is a loose structure. There’s no corporate entity here still. So they pass resolutions together in conferences where they say they are going to wait for one of Joseph Smith’s sons, probably Joseph Smith III to emerge to receive the prophetic calling and to accept that mantle. So when that happens in 1860, he comes to a conference of the New Organization, what becomes the Reorganization and what becomes Community of Christ, then that becomes something that all these little branches start to get really excited about. Fairly quickly, then that Reorganization draws from all the different tradition churches, including people who had gone west who are dissatisfied with what was going on under Brigham Young in Utah. 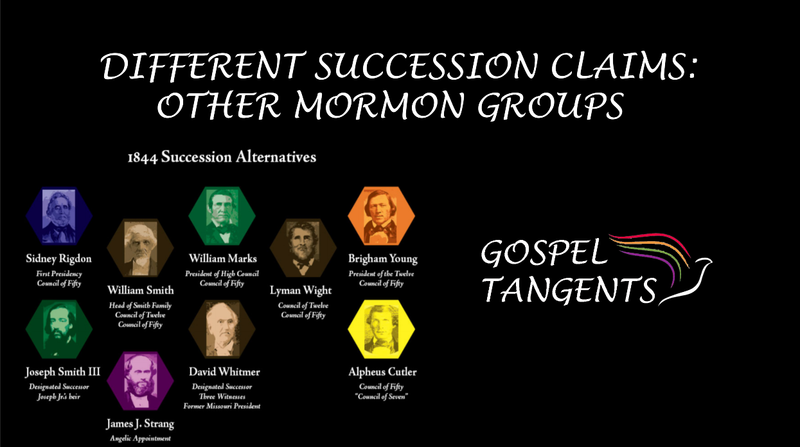 It turns out that some other Mormon schismatic groups are contemporaries of Joseph Smith III. John talks briefly about several of these churches, “There’s more –ites; that’s hardly an exhaustive group so I don’t mean to be leaving anybody out. They are very interesting.” He’ll briefly discuss founding of the Hedrickites, Williamites, Josephites, Cutlerites, Whitmerites, and their relationship to the RLDS Church. Lachlan MacKay will also tell when and why the Kirtland Temple changed from a bluish-gray color to the current white color it is today. It’s going to be a fun conversation. I hope you check out our Mormon Schisms Tour! Yesterday was President Monson’s funeral. When an LDS President dies, the First Presidency is dissolved. Have you ever wondered why that is the case? Historian John Hamer and apostle Lachlan MacKay of the Community of Christ will talk about why that happens in the LDS Church. It’s a really interesting conversation as we discussion several succession claims. We will also talk about some of the other leaders who wanted to take over leadership of the LDS Church in the early days. There’s a lot more people than you may recognize. I also encourage you to check out the video. John was kind enough to share some slides about the Succession crisis, and I have included them in the video. Don’t forget to check out our conversations with Greg Prince and Jim Vun Cannon on the Succession Crisis. Check out our conversation…..